Why now? GEH is at a critical juncture. The United Nations, World Health Organization, and other global health research institutions and NGOs are expanding the focus of the global health community beyond infectious disease to also include emerging epidemics of non-communicable diseases. At the same time, research is increasingly demonstrating the importance of environmental exposures, especially during fetal and infant development, to risks of diseases later in later life. As the Millennium Development Goals are set to expire in 2015, the global community has the opportunity to broaden efforts to improve public health by incorporating health indicators into the new Sustainable Development Goals. And lastly, a continuous pattern of extreme weather events and persistent climate changes over the past decade have heightened awareness and concern about the long-term implications of climate change, particularly on vulnerable populations around the world, and the need to incorporate health concerns into climate change mitigation and adaptation measures. Why you? We recognize that you are someone who shares our interest in GEH. And we believe that you also share our goal of building GEH community, scientific capacity, and awareness of the importance of environmental exposures in global public health. We hope that this newsletter will be a valuable tool for you in your work, and that in turn, you will help us accomplish our goals by reading it, sharing it with your colleagues, using it to make connections, and providing us with feedback on how to make it even more interesting and informative. When NIEHS principal researcher Stephanie London, M.D., Dr.P.H., began designing a large study of childhood asthma, she chose to conduct it in one of the most air polluted, ozone-laden places in the world—Mexico City. “Asthma is one the most common chronic disease of childhood, and it affects those who suffer from it throughout their lifespan,” says London, who heads NIEHS’ Genetics, Environment and Respiratory Disease Group. But, she says, no matter where it’s done, the work is both critical and applicable around the world. “The more we understand asthmas’ causes and the genetic variations that make some children more susceptible than others, the better we’ll be able to prevent and treat it." 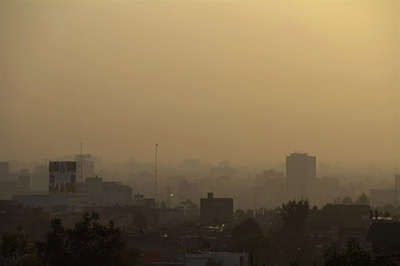 The extreme levels of air pollution in Mexico City provided just one of a number of reasons for doing the research outside U.S. borders. Because researchers planned to look at the links between genetics and exposures leading to asthma, the mixture of ethnic ancestries in Mexico City—predominantly Amerindian and European with a small component of African ancestry—offered further benefits. The work has also benefited from collaboration with international teams of researchers who have shared ideas, data and subsequent credit for the twenty-one (and counting) publications resulting from the study. “You need to build on what researchers around the world have found in order to advance science,” says Isabelle Romieu, M.D., M.P.H., Sc.D.who collaborated with London on the Mexico asthma project while she was a professor of epidemiology at the Instituto Nacional de Salud Publica in Cuernavaca, Mexico. “Not only was the collaboration invaluable,” says Romieu, now head of the Nutrition and Metabolism Section at the International Agency for Research on Cancer in Lyon, France, “but we helped to train many students at the institute as we worked together. She added that it is extremely useful to study distinct populations whose exposures and genetic make-up vary, which can provide insights into disease and environment interactions. Six hundred children with asthma and their parents enrolled in the study that began in the late 1990s. The range of findings has been impressive. For example, one conclusion is that asthmatic children with a genetic deficiency of GSTM1—part of a family of enzymes that play an important role in removing toxins from the body—not only are unusually susceptible to the deleterious effects of ozone, but they also seem to derive greater benefit from taking vitamins C and E. Other studies pinpointed a variety of genetic variations that seem to make children more susceptible to developing respiratory symptoms when they are exposed to ozone. One of the most promising developments on the horizon for the Mexico City study is its inclusion as part of an analysis of tens of thousands of samples collected from researchers around the world who have genome-wide association studies of asthma in different ethnic populations. Several years after the original data collection was completed London and Romieu were invited to participate in a new project to go back to subjects from asthma genome-wide association studies (GWAS) and get new samples that could be used to look at functional correlates to genotypes, and also to get permission for making new samples accessible to public databases. The new study obtained samples from 150 of the original subjects. These data are now part of a new consortium that should lead to greater understanding of the meaning of gene signals. Granted, there are special challenges in crossing borders, and in any study where . human samples are being collected. The Mexico City project has encountered such logistical problems. “The issues may seem mundane, but the challenges are multiplied when working internationally,” says London. In the original study, there were sometimes issues with Fedex being confused about samples when they changed planes in the United States. In the new study, there were problems with shipment of clean, empty sample kits to the data collection site Mexico where bureaucratic delays in customs took a while to sort out. “When doing studies internationally, you always need to be thinking of solutions for new things that just keep coming up,” says London. In the new study where researchers began meshing the Mexico City studies with GWAS of asthma. there were issues of how to structure questionnaires to get at the same information across different countries. Some questions just don’t translate exactly, or are inappropriate for cultural reasons. The extra effort global studies require, however, is well worth it, says London. Particularly when studying diseases like asthma that strike people worldwide, a worldview on research is essential. Not only do environmental issues and the severity of pollutants vary from place to place, but also the genetic makeup of people who develop environmentally linked diseases. Through collaboration, scientists around the world can not only avoid duplication, but also can build on each other’s findings.